Did you ever play team sports as a child? If you were anything like me (two left feet! ), you were the last one picked for the basketball team. Not only that, but you spent most of the game desperately hoping someone would take pity on you and you’d get thrown the ball just once in the game. All in all not a happy experience, but come on get over it, it’s only a game of basketball. Or maybe not… Naomi Eisenberger a leading social neuroscientist at University of California designed an experiment in 2003. Volunteers were invited to play a virtual ball game of catch ostensibly with two other people, all of whom were represented by avatars on the screen. Halfway through, their avatar stopped receiving the ball and they observed the other two avatars appearing to throw only to each other. Afterwards, the game players self-reported being quite bothered about being excluded (‘I felt rejected, I felt meaningless’). Furthermore, the brains of the volunteers (they had been lying in an MRI scanner for the duration) showed activity during the time they were ignored in the same parts of the brain (dorsal anterior cingulate cortex) as is associated with the distress of physical pain. Since then many experiments have replicated these findings and scientists are unequivocal about the influence of social interactions on many physiological and neurological reactions. As outlined in the last newsletter, our brains are constantly evaluating events for the level of reward or threat that they might present. Evian Gordon refers to this adaptive motivation as “minimize danger and maximize reward” , a fundamental organising principle of the brain. Our experiences are also mediated by another filter system in the brain which means that threatening or negative stimuli are processed more quickly, more intensely and last longer than reward-offering stimuli. This means that if we are presented simultaneously with a reward and threat-activating behaviours, our attention and energy gets invested in the latter. The profusion of bad versus good news stories in our media is testament to this; how many of us would buy a newspaper full only of happy stories and good news? The key to creating a ‘brain-friendly’ work environment requires a focus first of all on reducing the potential for the stress-inducing threat response and at the same time, striving to find ways to increase brain rewarding experiences. Leadership expert David Rock has developed a simple model that summarises some of the neuroscience research in this area. Known as the ‘SCARF’ model, it identifies five critical domains of social experience that have the potential to tip us into either threat or reward state of mind. This refers to how we see ourselves in relation to others. For example, when we feel ‘better’ than another person, our sense of status increases and simultaneously, the primary reward circuitry in the brain is activated. It’s why we enjoy winning at games. Conversely, the prospect of a performance review or negative feedback will cause the threat response to kick in. No surprises, there, few people enjoy hearing negative points about themselves. Yet there is still a strong discourse around the role of ‘feedback’ to help improve people’s performance. The ‘praise sandwich’ version of this attempts to give a nod to the need for positive endorsement but as pointed out above, the negative piece will have a much stronger impact. So being aware of how brain unfriendly they can be is the first step. Rock also advocates ensuring that performance feedback is participative and developmental and that managers strive to acknowledge and appreciate people as much as possible. Our brains like patterns and predictability. Uncertainty causes the brain to immediately divert valuable thinking resources and attention towards trying to fill these gaps. This is why so many of us find change difficult. Maximising certainty is about giving people road maps – explaining context and background to what’s happening, setting clear objectives, being explicit about expectations. Even where there is ‘bad news’, our brain prefers the certainty of hearing the worst to what might seem like a more supportive approach of only drip feeding the negative in stages to try and lessen the impact. This refers to the sense of control or choice we feel we have over aspects of our environment or our lives. Every parent knows how much more effective it is to present tasks as choices (‘do you want to read your bedtime story or brush your teeth first’ versus ‘go to bed now or else’). As adults, we are no different, for example micro-managing is a key trigger for most employees. In the workplace, autonomy will always have limitations but there are many ways to facilitate a sense of choice. Daniel Pink, who highlights autonomy as one of three critical motivators, cites a study of workers in an investment bank where managers who offered ‘autonomy support’ to staff reported higher job satisfaction and better performance. Our brains are wired to categorise people as being ‘in’ or ‘out’ of a social group and is closely linked to how we decide whom we can trust. We trust those who seem to be ‘in our group’ or like us but equally, we withdraw and detach when they do something to breach this trust. It also explains why a dispute or an issue between two people on a team can end up fracturing the whole team. So having an eye to team dynamics and fostering collaboration is essential. Rock cites a Gallup report from 2008 which showed that encouraging ‘water cooler’ conversations increased productivity! A sense of fair play is a primary need and we react very strongly to being treated unfairly, activating the part of the brain involved in intense emotions such as disgust. Rock also cites research that demonstrates when we feel unfairly treated, we feel rewarded when our superiors are punished. Our fairness triggers are so strong that given a choice between someone winning at our expense or both of us losing; we will more frequently select the latter. In terms of workplace conflict, feeling ‘unfairly treated’ is probably one of the most frequent reasons cited in grievances and complaints against managers. So striving to demonstrate openness and transparency around how decisions are made and be pro-active in this will help to maximise a sense of fairness. Much of the above is essentially common sense i.e. that people need to be treated fairly or the importance of trust in the workplace. What is less obvious however is that the social needs identified above aren’t simply a set of values that would be nice to aspire to in the modern workplace. Rather, the science is telling us that we are biologically hard-wired to react as strongly to having our social needs disrespected or unmet as to our basic physical and safety needs! Got an issue you are grappling with…? 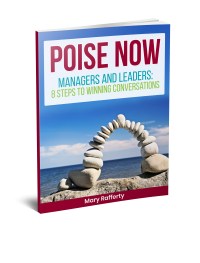 Mary Rafferty’s services include coaching, mediation and training in conflict related areas such as mastering difficult conversations and navigating tricky relationships. Bringing Out the Best in People: A Social Cognitive Neuroscience Perspective... Do I have to say ‘NO’?